Rebuilding American infrastructure has been a major theme in the news recently, as more and more people realize the need for better roads. However, the exact way this will play out isn't entirely clear. Not surprisingly, the future of logistics, especially trucking, could feel the effects of key projects that affect roadways, bridges and other structures. In a recent Harvard Business Review interview, Harvard University finance lecturer John Macomber denied that a spending crisis for infrastructure exists, instead saying that the future of any infrastructure attempt will hinge on the country's larger goals and locations, also defining the key ways in which we need to envision a rebuilding program for it to work. "We should be thinking about infrastructure as a long-term investment in competitiveness and quality of life, not as a spending program," Macomber said. "We should be selecting projects based on objective characteristics that benefit the most people at the optimum benefit/cost ratio, not as a way to spread money to all congressional districts." 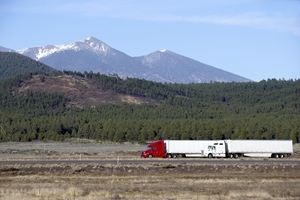 There's also the concern that re-established roads could offer truckers an immediate gain. It may not come up in many national discussions, but the state of Rhode Island has one example of a local plan to reinvent some of its infrastructure. The state's Department of Transportation recently announced a plan to replace the 6/10 Interchange, following initiative overseen by Governor Gina Raimondo. This improvement plan will reportedly cost $400 million and include visual improvements, greenspace and new links between neighborhoods. The measure seems designed to increase both local transportation on foot and bicycle as well as the use of vehicles. This may be just one small example of state improvement, but others could follow after it in an attempt to make serious changes. With changes possibly coming to the roads themselves, a viable, evolving business model makes more sense than ever. Just as supply chains themselves are changing, some of the means companies are using to manage shipping seem to be changing as well. The many different technologies set to disrupt this space include automated vehicles, drones and even a new model for logistics itself as an extension of a famous brand. The last point applies specifically to Amazon, which is reportedly developing a trucking system that could connect different drivers with payloads. It fits into the sense of "Uberizing" shipping behind the scenes, and, as Fortune pointed out, it could be the beginning of a shift within Amazon, as the company prepares to externalize its own shipping. If this does happen, could it point to a new way for major companies to develop shipping arms that benefit from new technology? Both the focus on better roads and the focus on better means of shipping hinge on an idea of adapting to the world around us. By that same token, global sourcing can free up companies to make choices that match their supply chain's increasing complexities.